Baseball continues to be a popular game both as a spectator sport and as a pastime. 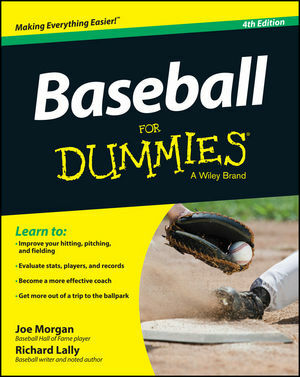 Since the publication of Baseball For Dummies, 3rd Edition, baseball teams have changed, new MLB stadiums have been built, and rules have been updated. This updated 4th Edition brings you the latest information on the players, the places, and above all, the game. Baseball For Dummies is for baseball fans at all levels, from players and coaches to spectators who love the game. Baseball Hall of Fame player Joe Morgan explains baseball with remarkable insight, using down-to-earth language so everyone from the casual observer to the die-hard fan can gain a fuller appreciation of the sport. Complete with Morgan's personal lists of top-ten toughest pitchers, smartest players, and most strategic managers, Baseball For Dummies gives you all the inside tips, facts, and stats so you can have Major League fun! Joe Morgan played on two Cincinnati Reds World Series championship teams and was elected to the Baseball Hall of Fame in 1990. Richard Lally has written numerous popular books on baseball and other subjects, including Bombers: An Oral History of the New York Yankees and Have Glove, Will Travel (which he co-authored with for Major League pitcher Bill Lee).